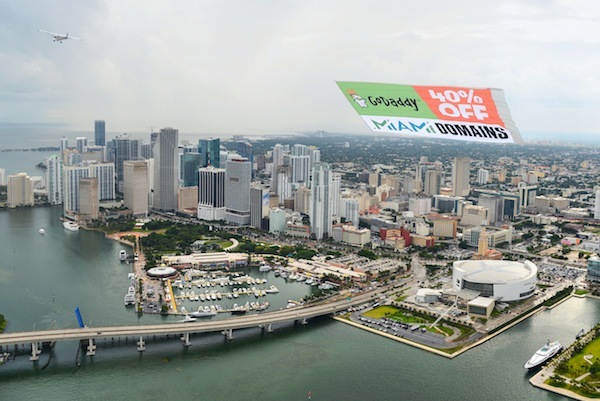 GoDaddy and the .Miami domain registry have been teaming up to market .Miami domain names using a variety of channels. One attention grabbing tactic was seen by thousands who attended the Miami Dolphins NFL game this past Sunday. As you can see from the photos above and below, a small airplane flew around Sun Life Stadium in Miami, Florida with a banner advertising .Miami domain names available at GoDaddy for “40% off.” The banner was part of a larger marketing effort being undertaken by Minds & Machines, the operators of the .Miami domain extension, and GoDaddy. Deborah Kearns of RIS Media published an article about Peter Niederman and his Kentwood Real Estate brokerage. As you may recall, Kentwood Real Estate acquired Denver.com in 2012 for an undisclosed seven figure purchase price. The domain name was sold by Boulevards, a company that owns many large city .com domain names. Judging by Peter’s comments in the RIS Media article, it seems that things are going well for Kentwood and Denver.com. In the article, Peter recalled that some people thought he was “crazy” for spending seven figures on the domain name, but the purchase has “paid off” for him and his company. I was born and raised in New Hampshire, and I currently live in just outside of Boston, which is about an hour from New Hampshire. I learned how to ski in New Hampshire (Loon and Waterville Valley), spent time in the lakes region, and enjoyed being raised in NH (for the most part). I also own quite a few real estate domain names such as WhiteMountainsRealEstate.com, JaffreyRealEstate.com, BowRealEstate.com, LakeWinnisquamRealEstate.com, and a few others. Josh Metnick: How Should Illinois.com Be Used? Josh Metnick is an Internet entrepreneur who sold Chicago.com to the Chicago Sun-Times for an undisclosed figure. Yesterday, Josh posted a tweet with a link to a Quora page he created soliciting opinions on what to put on Illinois.com, a domain name his company owns. At the moment, Illinois.com hosts a simple landing page announcing that “Something incredible is coming soon,” although it seems like what is coming has yet to be determined.